A pro-independence protestor waves an Estelada (Catalan separatist flag) outside the Generalitat Palace, the regional government headquarters, in Barcelona, Spain, October 26, 2017. MADRID/BARCELONA - Catalonia’s leader Carles Puigdemont was set on Thursday to call a snap regional election, reacting to pressure from the Spanish government as it prepared to take direct control of the autonomous region to block its drive for independence. An election might not be enough to delay the imposition of direct rule, which Spain’s Senate was expected to approve on Friday. But even before it was announced, the vote was sowing division and anger in the secessionist movement, many of whose members want Puigdemont to go further and make a unilateral declaration of independence. Puigdemont, who is president of the regional government, had been due to make a statement early on Thursday afternoon but it was postponed. Several members of his pro-independence coalition, however, said he would dissolve the regional parliament and call the election. Catalan broadcasters said he would deliver a speech later in the afternoon. The developments add to the confusion and turmoil in one of Spain’s gravest political crises since its return to democracy four decades ago. The battle of wills follows an independence referendum in Catalonia on Oct. 1 which Madrid declared illegal and the Catalan government said endorsed its claim to statehood. The independence drive has caused deep resentment elsewhere in Spain, prompted a flight of business from the wealthy region, and worried other European leaders who see it as fanning separatist sentiment elsewhere on the continent. It was not yet clear whether Prime Minister Mariano Rajoy would still impose direct rule as planned or simply seek the Senate’s authorization to do so on Friday but without making it effective on the ground. Rajoy’s government said on Monday that calling a snap election would not be enough and Puigdemont would also have to withdraw an ambiguous declaration of independence he made on Oct. 10. “The calling of elections is important but it is not the only objective,” José Manuel Barreiro, Senate spokesman for the ruling People’s Party, said on Thursday. The opposition Socialist Party has said it should be sufficient to forestall direct rule. La Vanguardia newspaper, citing sources in Rajoy’s party, said the premier was ready to suspend the application of direct rule if elections were called. A regional election could either strengthen Puigdemont’s mandate if pro-independence parties won, allow him a graceful exit if they did not, or heighten divisions within the secessionist camp and bring the current campaign to a halt. 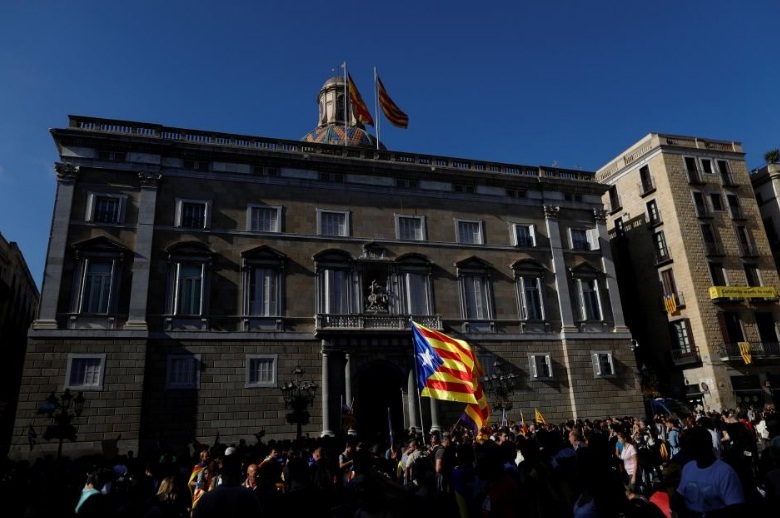 In central Barcelona, several hundred independence supporters gathered outside the regional government headquarters, waving Catalan flags and chanting “Puigdemont traitor” in the Catalan language. Gabriel Rufian, a member of Spain’s parliament for the pro-independence party ERC, tweeted “155 silver coins” as rumors of Puigdemont’s plans to call an election emerged -- a reference to betrayal. And Catalonia’s pro-independence party ERC would leave the regional government if regional president Carles Puigdemont calls a snap election, a party source said. Some pro-secession lawmakers and mayors also announced they would step down. “I don’t share the decision to call an election. I am resigning as a lawmaker and a member of PdeCat (Puigdemont‘sCatalan Democratic Party),” said Jordi Cuminal on Twitter. Far-left party CUP, which supports Puigdemont’s minority government, said it would oppose a vote. An opinion poll published by the El Periodico newspaper on Sunday showed a snap election would probably have results similar to the last ballot in 2015, when a coalition of pro-independence parties formed a minority government. Exactly how the central government would impose direct rule in practical terms, and how Catalan civil servants and regional police would react, was also uncertain. Some independence supporters have threatened a campaign of civil disobedience, raising the possibility of confrontations in the streets of Barcelona and other parts of the northeastern region. National police used heavy-handed tactics to try to prevent the Oct. 1 referendum from taking place. Demand for Spanish debt and shares jumped on the news of a potential election in Catalonia, which contributes about a fifth of Spain’s economy, the fourth-largest in the euro zone. The yield on Spain’s 10-year benchmark bond dropped by more than 6 basis points, while the leading stock market the IBEX extended gains to hit a two-week high. Catalonia’s leader Carles Puigdemont was set on Thursday to call a snap regional election, reacting to pressure from the Spanish government as it prepared to take direct control of the autonomous region to block its drive for independence. An election might not be enough to delay the imposition of direct rule, which Spain’s Senate was expected to approve on Friday.